The end of the outreach is always bitter sweet. You know you are about to leave soon but you also start finding out the difference you have helped to make. By the time he was three years old, Sakoba had developed severely bowed legs. 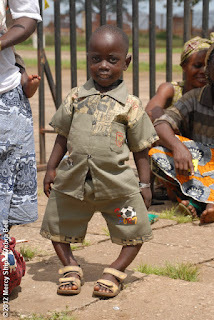 A naturally happy and energetic boy, Sakoba adapted well, finding his own gait to keep mobile. His mother, Kadiatou, often struggled to keep up with Sakoba, due to her own painful hindrance – Kadiatou was also born with legs that bowed deeply in her early years. 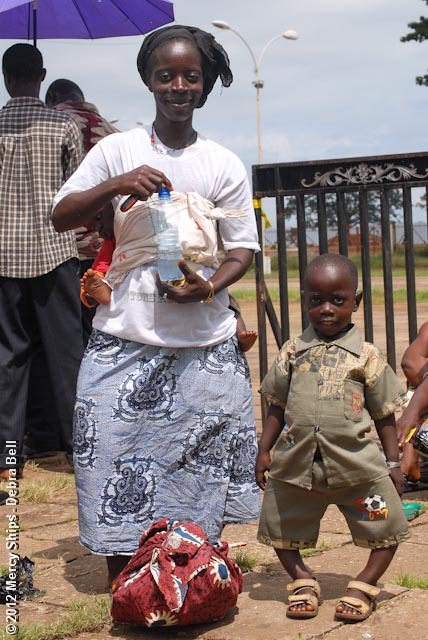 Kadiatou and her husband, Mouctar, prayed for healing for Sakoba. Then, according to Kadiatou, something miraculous occurred. 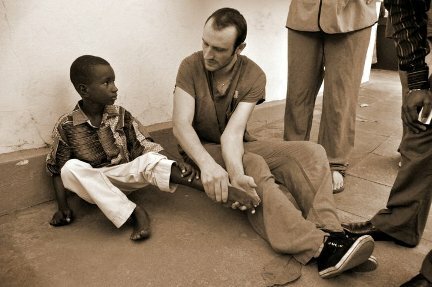 “Our neighbor told us that a big hospital ship was examining people in Conakry the very next day. He said that they might be able to help Sakoba.” Kadiatou hastily bundled up Sakoba and one-year old Ibrahim. They arrived at the Mercy Ships screening site just in time. 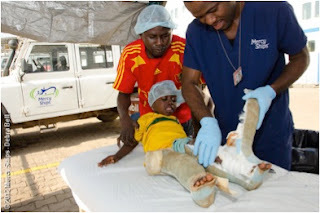 Sakoba was one of the last children, out of hundreds, examined for possible orthopedic surgery. When Sakoba was given an appointment for surgery onboard the Africa Mercy hospital ship, Kadiatou was thankful to God that her son would have straight legs. 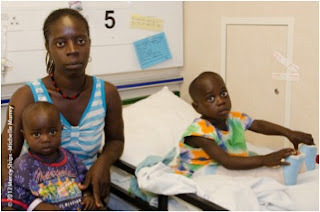 Kadiatou and Ibrahim accompanied Sakoba to the Africa Mercy hospital ship. Mouctar, who suffered from leprosy, stayed home because he did not think he would be allowed onboard the ship. 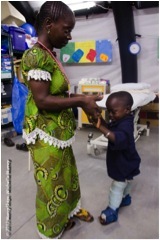 While Sakoba recovered from his successful surgery, Kadiatou basked in the loving environment of the hospital ward. She confided to Marie, a Mercy Ships volunteer, “I am cursed with bad legs, and Mouctar, my husband, is cursed with leprosy. 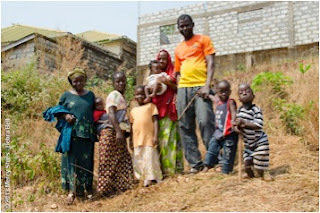 Because we are cursed and useless, our children will have lives of suffering too.” This was not the first time that Marie had heard about the deep fatalistic beliefs that could strangle entire communities. But Kadiatou’s cloak of sadness lifted as she found unexpected solace in the kindness showered on her, Ibrahim and Sakoba. Mouctar and Kadiatou were surprised to learn that Mouctar was not an outcast as far as Mercy Ships was concerned. Leprosy struck Mouctar in his youth, but the disease has been halted and is managed with medications through a local clinic. Mouctar was more than welcome to accompany his son to his post-surgery appointments. Kadiatou is delighted that Sakoba’s legs are straight and strong. 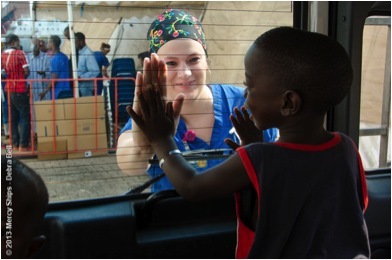 Kadiatou found solace in the kindness showered on her and Sakoba during their stay in the Africa Mercy hospital ship. Kadiatou loved how she and Sakoba were accepted and included, rather than being treated like outcasts. Volunteer Laura Zuilkowski was one of Sakoba’s favorite friends. I will always remember Sakoba as the little kid that always always always ran through our door (uninvited) and greeted us with a warm hug. With his little brother never too far behind. It would never matter how busy we were, he would always run through and dodge everything that was going on and make his way straight to you and give you a hug. I never complained because he is the cutest little kid ever with his little brother not too far behind. His hugs, joy and smile often reminded me of how much God loves us.